I most definitely do. Every year it makes me a little bit sad that asparagus season is so short. It always feels like it’s gone before we’ve eaten nearly enough of it! This side dish was thrown together on a bit of a whim, as a way of doing something a little different with our asparagus. I tend to stick to simply steaming it, or sautéing it with some olive oil and salt and pepper. And while I love my asparagus cooked that way, I wanted to brighten it up a bit. 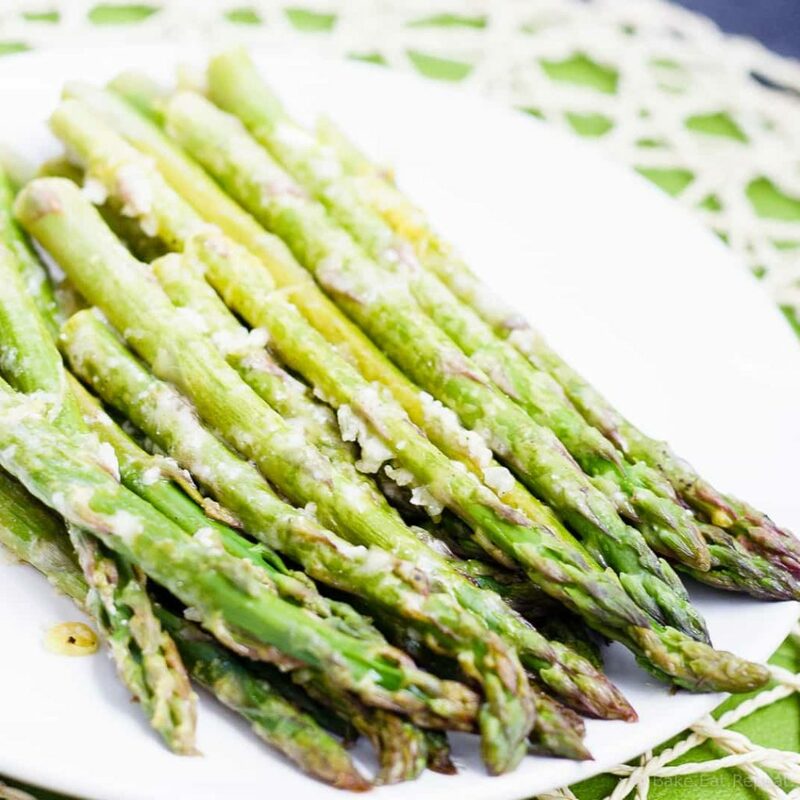 This lemon roasted asparagus with parmesan cheese and garlic did the trick. It takes less than 5 minutes to toss together, and only 10 minutes to roast in the oven. That’s not a whole lot longer than throwing it in the microwave, but it’s definitely a whole lot tastier! Plus, it’s so good, that my 7 year old even declared it “bloggable”. So of course, I had to oblige. He’s never even agreed to more than a taste of asparagus before, to which the pronouncement has always been “yuck”. So now you know it’s good! My asparagus hating child loved it. And so did the asparagus loving people around here! It was a nice change and will definitely be making it into the rotation around here. Obviously. It is bloggable after all! Note: My asparagus was quite thick, and it took 10 minutes to roast, but I like mine still a bit crisp. If your asparagus is really skinny, or you like it a little more well done you may have to adjust the roasting time accordingly. Also, the bright lemon flavour really shines through in this recipe, so if you just want a hint of lemon instead, reduce the lemon juice/zest to half a lemon. Wash the asparagus and snap off the woody ends, it will naturally snap where the tough part of the spear ends. Pat the asparagus dry with paper towel and spread it out on a rimmed baking sheet. In a small bowl, whisk together the lemon juice, zest, olive oil and garlic. Drizzle this mixture over the asparagus and toss them around lightly to coat them completely. Sprinkle with salt and pepper to taste, and the parmesan cheese. Roast for 10-12 minutes, until the asparagus is tender. Love roasted asparagus! They look divine and I'm loving the summery lemon flavours! I can't get enough of asparagus especially during this time of year! These looks perfect, Stacey! Love the lemon, garlic and parm combo! Oh the wonderful thing about asparagus! I love how easy it is to whip up and this favor combo sounds amazing! Love asparagus and this is such a great way to cook them! Trying these soon! Wow looks so good Stacey! Perfect side dish for summer! Yes to asparagus!!! I love it so much! I love how simple this is! Hope you had an amazing weekend!! ME ME ME!!! I am loving your flavor combo! Lemon and parm... YES, please! What a beautiful looking side dish! I absolutely love asparagus, and you made look even more inviting! Full of yum and good health! Asparagus is one of my favorites but I always prepare it the same way, just simply roasted with salt and pepper. I need to try it with lemon like this! That's exactly what I do too Sara - just do the same thing every time! It was kind of nice to change it up a bit! YES!!! This looks so perfect for the dinner party I'm having Monday. Thank you!! Thanks Becky! Hope you like it! This is such a gorgeous side dish!!! Pinning! Asparagus is my favorite summertime veggies. Love it on the grill, but always looking for others way to cook it. Never thought of roasting it duh. This looks delish Stacey! :) Pinned!! Basically the same thing - I almost just threw this on the grill, but it was full with other things! Thanks Cyndi! Asparagus is my favorite veggie to roast! I usually add garlic and parmesan, so I will have to try out this lemon version. Sounds delicious, Stacey! 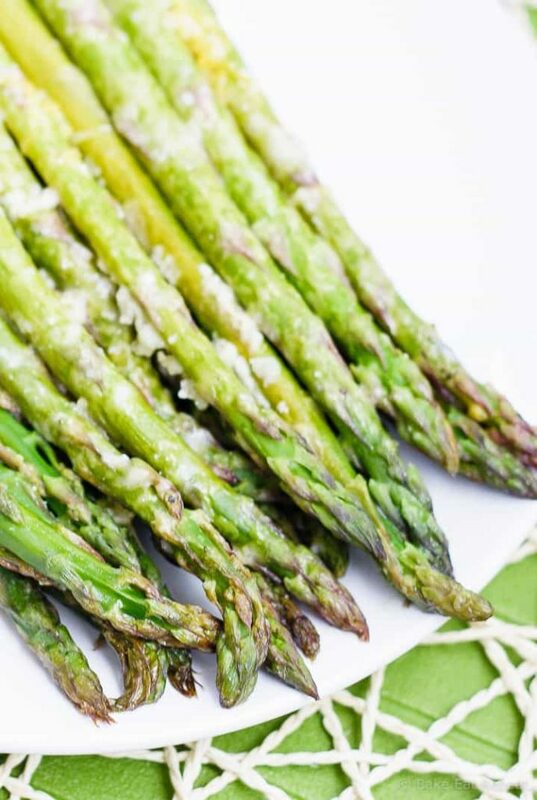 Asparagus is my FAVORITE spring time vegetal yumminess...I just can't get enough of it! And then roasted up with lemony goodness? SWOON. Pinned! Roasted vegetables are just the best, and asparagus is definitely my favourite in the spring too! Thanks Taylor! Yep, they make me laugh a little. Now instead of telling me they like something, they just yell "it's bloggable!". To everything. Not just things I've made - also things like apples. But sometimes they're right! :) Thanks Ashley! I so feel like a moron for never thinking to roast asparagus with lemon. I guess that's what amazing people like you are for! Love this for a quick side dish! These photos just scream "spring!"